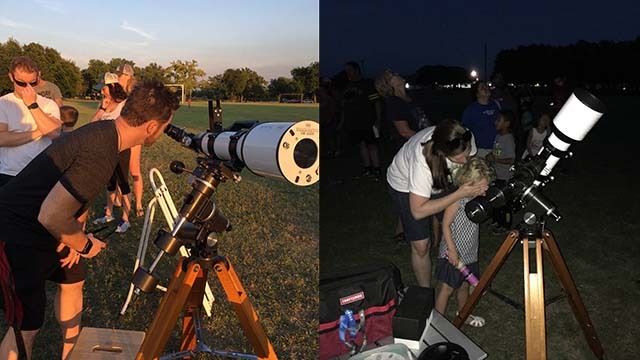 It has been a couple of year's since I've visited a star party at the Liberty Hill Library. They are always lots of fun with lots of enthusiastic adults and kids. There were three telescopes there. We were very busy all evening. There were nice views of a couple of sunspot groups, Jupiter with a nice arrangement of the Galilean moons, and Saturn later in the evening. The event was sponsored by the library and a cub scout pack and attended by about 60 people. A highlight of the evening was a mother and daughter who had their first views through a telescope. It is always a thrill to share someone's experience of something wonderful for the first time. Jim and Joyce were there with a big Dob, as they are at so many of these events. We were joined by a couple of new AAS members who were excited about the (slightly) darker skies and did a great job helping with the crowd. We could have kept twice as many scopes busy. This was my first star party using the Explore Scientific 102mm achromat refractor that Mary gave me. I'd had it out a couple of times before I injured my shoulder, so I was excited to try it again. There is a little chromatic aberration on bright targets. Last night I tried a sky glow filter. With Jupiter and Saturn, it has wonderful sharp views as good or better than my 89mm Questar. This size scope is often considered grab-and-go, but that is a relative term. With a Vixen Polaris mount and wood tripod it must weigh three times what the Questar does. I'd forgotten that I have to recenter the target after every couple of visitors without a clock drive. I have one that I can use, but I have to fabricate an adapter for the Vixen mount. I'm used to a fork mounted scope on a wedge, the motions and controls on the Questar just work easily for me. The German equatorial mount tracks targets in the same way, but I always have a harder time with one - the controls change positions more as I move to different parts of the sky. I suspect my muscle memory will eventually close the gap. With the clock drive I think that this will be a great star party scope. It is nice to have a second scope for visual observation, when I'm doing long imaging runs with the Questar. This is more compact than my 8" Dobsonian.